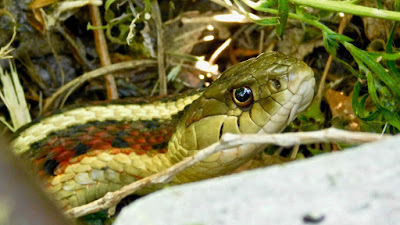 Speaking of serpents, with summer in full swing, the reptiles are out searching for sun. 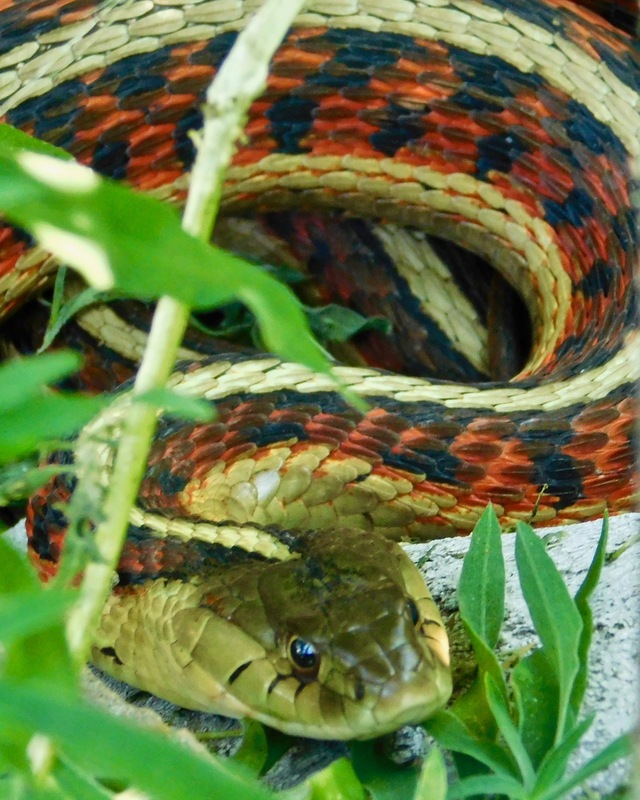 Slithering out from the depths of his crowded winter den, a red-sided garter snake spends the afternoon in a shady patch of tall grass. 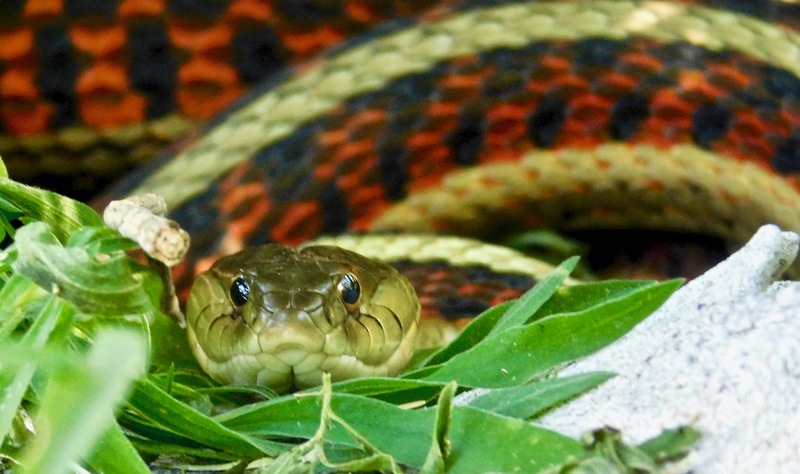 The red-sided garter snake rises early in order to begin regulating his body temperature. He’s warmed up by solar rays and becomes most active in the morning before it gets too hot. He spends much of his time near water because that’s where he finds his favorite foods. This common snake eats earthworms, amphibians, leeches, slugs, snails, insects, crayfish, small fish and other snakes. He’s uniquely immune to the toxic secretions of toads and can eat them without harm. 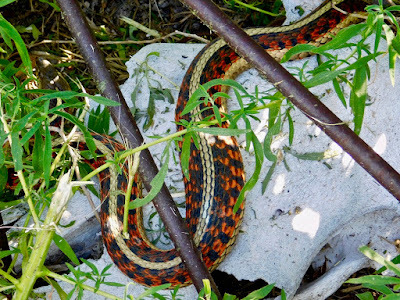 While hunting, the red-sided garter snake uses his superb sense of smell and vision in order to capture prey. He strikes with precision using sharp teeth and quick reflexes thus immobilizing his unfortunate victim. 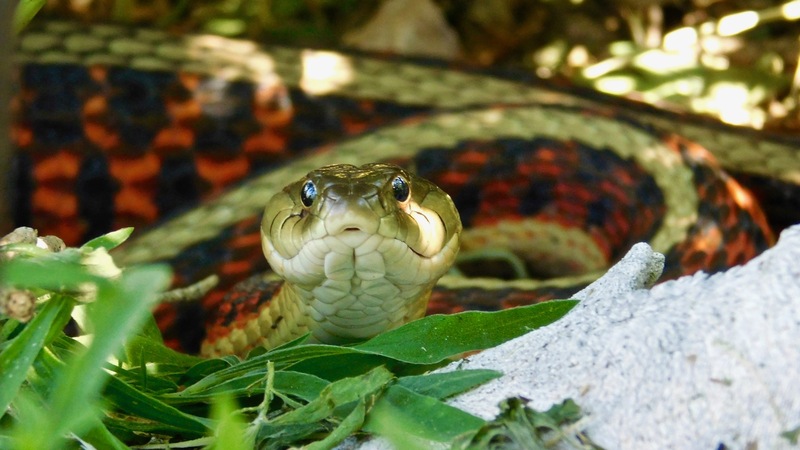 Harmless to humans, his saliva is slightly toxic to smaller animals making it easier for him to manage his meal. A data-collecting tongue emerges from an imposing head that looks like its been constructed from fitted bits of chiseled stone. 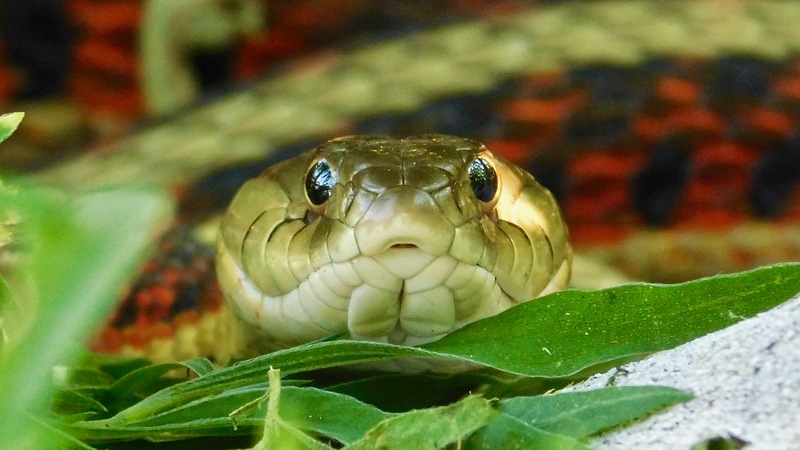 The perfectly circular eyes are razor sharp and shimmer with metallic hues. The red-sided is a beautiful snake distinguished by his geometric symmetry. He’s cream-colored with two red stripes running the length of his body that are overlaid by a black checkerboard pattern. 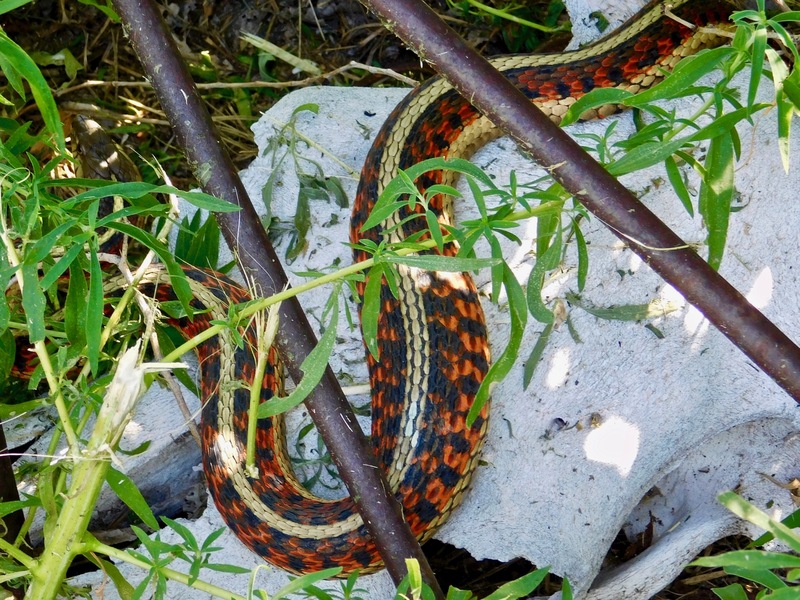 Despite his undisputed beauty and docile nature the garter snake is often persecuted by people. 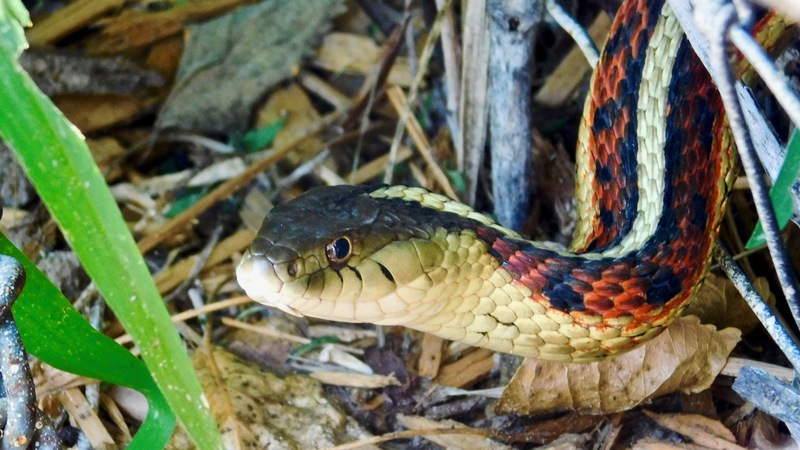 In reality he plays a vital role in the ecosystem and when confronted by a human, he’ll hastily retreat. 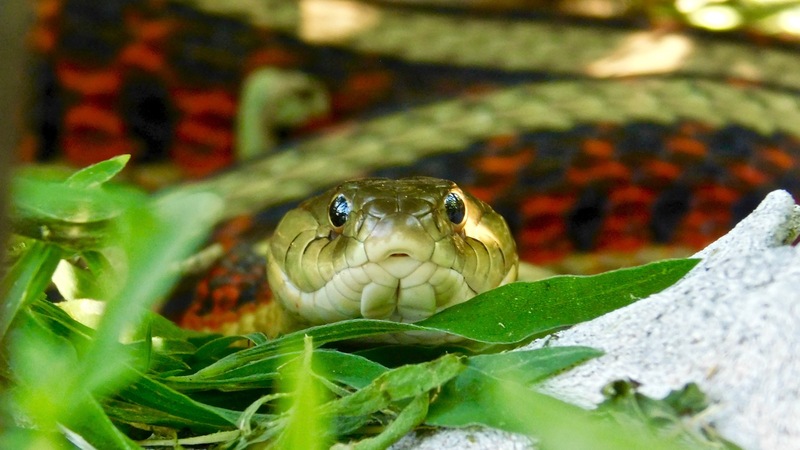 If he’s backed into a corner, he’ll coil, hiss and flare into a dramatic display of self-defense. Truthfully, though, he’s not much different from most of us because I believe he’d rather be left alone to live his life in peace and harmony.